1 A None No Power Seat 1 A is a standard First Class Bulkhead seat. However, the proximity to the lavatory and galley may be bothersome. 1 E None No Power Seat 1 E is a standard First Class Bulkhead seat. However, the proximity to the lavatory and galley may be bothersome. 1 F None No Power Seat 1 F is a standard First Class Bulkhead seat. However, the proximity to the lavatory and galley may be bothersome. 1 K None No Power Seat 1 K is a standard First Class Bulkhead seat. However, the proximity to the lavatory and galley may be bothersome. 10 A None No Power Seat 10 A is a Business Class Bulkhead seat offering more privacy. However, the proximity to the galley and lavatory may be bothersome. 10 B None No Power Seat 10 B is a Business Class Bulkhead seat offering more privacy. However, the proximity to the galley and lavatory may be bothersome. 10 E None No Power Seat 10 E is a Business Class Bulkhead seat offering more privacy. However, the proximity to the galley and lavatory may be bothersome. 10 F None No Power Seat 10 F is a Business Class Bulkhead seat offering more privacy. However, the proximity to the galley and lavatory may be bothersome. 10 J None No Power Seat 10 J is a Business Class Bulkhead seat offering more privacy. However, the proximity to the galley and lavatory may be bothersome. 10 K None No Power Seat 10 K is a Business Class Bulkhead seat offering more privacy. However, the proximity to the galley and lavatory may be bothersome. 11 A None No Power Seat 11 A is a Business Class Bulkhead seat that may have restricted legroom. The proximity to the lavatory and galley may be bothersome. There is no floor storage during take off and landing. 11 B None No Power Seat 11 B is a Business Class Bulkhead seat that may have restricted legroom. The proximity to the lavatory and galley may be bothersome. There is no floor storage during take off and landing. 11 E None No Power Seat 11 E is a Business Class Bulkhead seat that may have restricted legroom. The proximity to the lavatory and galley may be bothersome. There is no floor storage during take off and landing. 11 F None No Power Seat 11 F is a Business Class Bulkhead seat that may have restricted legroom. The proximity to the lavatory and galley may be bothersome. There is no floor storage during take off and landing. 11 J None No Power Seat 11 J is a Business Class Bulkhead seat that may have restricted legroom. The proximity to the lavatory and galley may be bothersome. There is no floor storage during take off and landing. 11 K None No Power Seat 11 K is a Business Class Bulkhead seat that may have restricted legroom. The proximity to the lavatory and galley may be bothersome. There is no floor storage during take off and landing. 12 B None No Power Seat 12 B is a standard Business Class seat. 12 E None No Power Seat 12 E is a standard Business Class seat. 12 J None No Power Seat 12 J is a standard Business Class seat. 14 B None No Power Seat 14 B is a standard Business Class seat. 14 E None No Power Seat 14 E is a standard Business Class seat. However, there may be noise in this area due to the bassinet location behind. 14 F None No Power Seat 14 F is a standard Business Class seat. However, there may be noise in this area due to the bassinet location behind. 14 J None No Power Seat 14 J is a standard Business Class seat. 16 A None No Power Seat 16 A is an Economy Class Bulkhead seat that may have limited legroom. The tray table is in the armrest, making the armrest immovable and slightly reducing seat width. There is no floor storage for this seat during takeoff and landing. 16 B None No Power Seat 16 B is an Economy Class Bulkhead seat that may have limited legroom. The tray table is in the armrest, making the armrest immovable and slightly reducing seat width. There is no floor storage for this seat during takeoff and landing. 16 D None No Power Seat 16 D is an Economy Class Bulkhead seat that may have limited legroom. The tray table is in the armrest, making the armrest immovable and slightly reducing seat width. There is no floor storage for this seat during takeoff and landing. This is a bassinet location and passengers traveling with infants may be seated in this area. 16 E None No Power Seat 16 E is an Economy Class Bulkhead seat that may have limited legroom. The tray table is in the armrest, making the armrest immovable and slightly reducing seat width. There is no floor storage for this seat during takeoff and landing. This is a bassinet location and passengers traveling with infants may be seated in this area. 16 F None No Power Seat 16 F is an Economy Class Bulkhead seat that may have limited legroom. The tray table is in the armrest, making the armrest immovable and slightly reducing seat width. There is no floor storage for this seat during takeoff and landing. This is a bassinet location and passengers traveling with infants may be seated in this area. 16 G None No Power Seat 16 G is an Economy Class Bulkhead seat that may have limited legroom. The tray table is in the armrest, making the armrest immovable and slightly reducing seat width. There is no floor storage for this seat during takeoff and landing. This is a bassinet location and passengers traveling with infants may be seated in this area. 16 J None No Power Seat 16 J is an Economy Class Bulkhead seat that may have limited legroom. The tray table is in the armrest, making the armrest immovable and slightly reducing seat width. There is no floor storage for this seat during takeoff and landing. 16 K None No Power Seat 16 K is an Economy Class Bulkhead seat that may have limited legroom. The tray table is in the armrest, making the armrest immovable and slightly reducing seat width. There is no floor storage for this seat during takeoff and landing. 17 B None No Power Seat 17 B is a standard Economy Class seat. All B seats may have limited legroom and storage space underneath the seat due to the presence of an entertainment equipment box under the seat in front. 17 D None No Power Seat 17 D is a standard Economy Class seat. All D seats may have limited legroom and storage space underneath the seat due to the presence of an entertainment equipment box under the seat in front. 17 G None No Power Seat 17 G is a standard Economy Class seat. All G seats may have limited legroom and storage space underneath the seat due to the presence of an entertainment equipment box under the seat in front. 17 J None No Power Seat 17 J is a standard Economy Class seat. All J seats may have limited legroom and storage space underneath the seat due to the presence of an entertainment equipment box under the seat in front. 18 B None No Power Seat 18 B is a standard Economy Class seat. All B seats may have limited legroom and storage space underneath the seat due to the presence of an entertainment equipment box under the seat in front. 18 D None No Power Seat 18 D is a standard Economy Class seat. All D seats may have limited legroom and storage space underneath the seat due to the presence of an entertainment equipment box under the seat in front. 18 G None No Power Seat 18 G is a standard Economy Class seat. All G seats may have limited legroom and storage space underneath the seat due to the presence of an entertainment equipment box under the seat in front. 18 J None No Power Seat 18 J is a standard Economy Class seat. All J seats may have limited legroom and storage space underneath the seat due to the presence of an entertainment equipment box under the seat in front. 19 B None No Power Seat 19 B is a standard Economy Class seat. All B seats may have limited legroom and storage space underneath the seat due to the presence of an entertainment equipment box under the seat in front. 19 D None No Power Seat 19 D is a standard Economy Class seat. All D seats may have limited legroom and storage space underneath the seat due to the presence of an entertainment equipment box under the seat in front. 19 G None No Power Seat 19 G is a standard Economy Class seat. All G seats may have limited legroom and storage space underneath the seat due to the presence of an entertainment equipment box under the seat in front. 19 J None No Power Seat 19 J is a standard Economy Class seat. All J seats may have limited legroom and storage space underneath the seat due to the presence of an entertainment equipment box under the seat in front. 2 K None No Power Seat 2 K is a standard First Class seat. 20 B None No Power Seat 20 B is a standard Economy Class seat. All B seats may have limited legroom and storage space underneath the seat due to the presence of an entertainment equipment box under the seat in front. 20 D None No Power Seat 20 D is a standard Economy Class seat. All D seats may have limited legroom and storage space underneath the seat due to the presence of an entertainment equipment box under the seat in front. 20 G None No Power Seat 20 G is a standard Economy Class seat. All G seats may have limited legroom and storage space underneath the seat due to the presence of an entertainment equipment box under the seat in front. 20 J None No Power Seat 20 J is a standard Economy Class seat. All J seats may have limited legroom and storage space underneath the seat due to the presence of an entertainment equipment box under the seat in front. 21 B None No Power Seat 21 B is a standard Economy Class seat. All B seats may have limited legroom and storage space underneath the seat due to the presence of an entertainment equipment box under the seat in front. 21 D None No Power Seat 21 D is a standard Economy Class seat. All D seats may have limited legroom and storage space underneath the seat due to the presence of an entertainment equipment box under the seat in front. 21 G None No Power Seat 21 G is a standard Economy Class seat. All G seats may have limited legroom and storage space underneath the seat due to the presence of an entertainment equipment box under the seat in front. 21 J None No Power Seat 21 J is a standard Economy Class seat. All J seats may have limited legroom and storage space underneath the seat due to the presence of an entertainment equipment box under the seat in front. 22 B None No Power Seat 22 B is a standard Economy Class seat. All B seats may have limited legroom and storage space underneath the seat due to the presence of an entertainment equipment box under the seat in front. 22 D None No Power Seat 22 D is a standard Economy Class seat. All D seats may have limited legroom and storage space underneath the seat due to the presence of an entertainment equipment box under the seat in front. 22 G None No Power Seat 22 G is a standard Economy Class seat. All G seats may have limited legroom and storage space underneath the seat due to the presence of an entertainment equipment box under the seat in front. 22 J None No Power Seat 22 J is a standard Economy Class seat. All J seats may have limited legroom and storage space underneath the seat due to the presence of an entertainment equipment box under the seat in front. 23 B None No Power Seat 23 B is a standard Economy Class seat. All B seats may have limited legroom and storage space underneath the seat due to the presence of an entertainment equipment box under the seat in front. 23 D None No Power Seat 23 D is a standard Economy Class seat. All D seats may have limited legroom and storage space underneath the seat due to the presence of an entertainment equipment box under the seat in front. 23 G None No Power Seat 23 G is a standard Economy Class seat. All G seats may have limited legroom and storage space underneath the seat due to the presence of an entertainment equipment box under the seat in front. 23 J None No Power Seat 23 J is a standard Economy Class seat. All J seats may have limited legroom and storage space underneath the seat due to the presence of an entertainment equipment box under the seat in front. 24 B None No Power Seat 24 B is a standard Economy Class seat. All B seats may have limited legroom and storage space underneath the seat due to the presence of an entertainment equipment box under the seat in front. 24 D None No Power Seat 24 D is a standard Economy Class seat. All D seats may have limited legroom and storage space underneath the seat due to the presence of an entertainment equipment box under the seat in front. 24 G None No Power Seat 24 G is a standard Economy Class seat. All G seats may have limited legroom and storage space underneath the seat due to the presence of an entertainment equipment box under the seat in front. 24 J None No Power Seat 24 J is a standard Economy Class seat. All J seats may have limited legroom and storage space underneath the seat due to the presence of an entertainment equipment box under the seat in front. 25 B None No Power Seat 25 B is a standard Economy Class seat. All B seats may have limited legroom and storage space underneath the seat due to the presence of an entertainment equipment box under the seat in front. 25 D None No Power Seat 25 D is a standard Economy Class seat. All D seats may have limited legroom and storage space underneath the seat due to the presence of an entertainment equipment box under the seat in front. 25 G None No Power Seat 25 G is a standard Economy Class seat. All G seats may have limited legroom and storage space underneath the seat due to the presence of an entertainment equipment box under the seat in front. 25 J None No Power Seat 25 J is a standard Economy Class seat. All J seats may have limited legroom and storage space underneath the seat due to the presence of an entertainment equipment box under the seat in front. 26 B None No Power Seat 26 B is a standard Economy Class seat. All B seats may have limited legroom and storage space underneath the seat due to the presence of an entertainment equipment box under the seat in front. 26 D None No Power Seat 26 D is a standard Economy Class seat. All D seats may have limited legroom and storage space underneath the seat due to the presence of an entertainment equipment box under the seat in front. 26 G None No Power Seat 26 G is a standard Economy Class seat. All G seats may have limited legroom and storage space underneath the seat due to the presence of an entertainment equipment box under the seat in front. 26 J None No Power Seat 26 J is a standard Economy Class seat. All J seats may have limited legroom and storage space underneath the seat due to the presence of an entertainment equipment box under the seat in front. 27 B None No Power Seat 27 B is a standard Economy Class seat. All B seats may have limited legroom and storage space underneath the seat due to the presence of an entertainment equipment box under the seat in front. 27 D None No Power Seat 27 D is a standard Economy Class seat. All D seats may have limited legroom and storage space underneath the seat due to the presence of an entertainment equipment box under the seat in front. 27 G None No Power Seat 27 G is a standard Economy Class seat. All G seats may have limited legroom and storage space underneath the seat due to the presence of an entertainment equipment box under the seat in front. 27 J None No Power Seat 27 J is a standard Economy Class seat. All J seats may have limited legroom and storage space underneath the seat due to the presence of an entertainment equipment box under the seat in front. 28 B None No Power Seat 28 B is a standard Economy Class seat. All B seats may have limited legroom and storage space underneath the seat due to the presence of an entertainment equipment box under the seat in front. 28 D None No Power Seat 28 D is a standard Economy Class seat. All D seats may have limited legroom and storage space underneath the seat due to the presence of an entertainment equipment box under the seat in front. 28 G None No Power Seat 28 G is a standard Economy Class seat. All G seats may have limited legroom and storage space underneath the seat due to the presence of an entertainment equipment box under the seat in front. 28 J None No Power Seat 28 J is a standard Economy Class seat. All J seats may have limited legroom and storage space underneath the seat due to the presence of an entertainment equipment box under the seat in front. 29 D None No Power Seat 29 D is a standard Economy Class seat. All D seats may have limited legroom and storage space underneath the seat due to the presence of an entertainment equipment box under the seat in front. 29 G None No Power Seat 29 G is a standard Economy Class seat. All G seats may have limited legroom and storage space underneath the seat due to the presence of an entertainment equipment box under the seat in front. 3 K None No Power Seat 3 K is a standard First Class seat. 30 A None No Power Seat 30 A is an Economy Class Exit Row seat that has extra legroom. The tray table is in the armrest, making the armrest immovable and slightly reducing seat width. There is no floor storage for this seat during takeoff and landing. 30 B None No Power Seat 30 B is an Economy Class Exit Row seat that has extra legroom. The tray table is in the armrest, making the armrest immovable and slightly reducing seat width. There is no floor storage for this seat during takeoff and landing. 30 D None No Power Seat 30 D is an Economy Class Bulkhead seat that has extra legroom. However, this is a bassinet location and passengers traveling with infants may be seated in this area. The tray table is in the armrest, making the armrest immovable and slightly reducing seat width. There is no floor storage for this seat during takeoff and landing. 30 E None No Power Seat 30 E is an Economy Class Bulkhead seat that has extra legroom. However, this is a bassinet location and passengers traveling with infants may be seated in this area. The tray table is in the armrest, making the armrest immovable and slightly reducing seat width. There is no floor storage for this seat during takeoff and landing. 30 F None No Power Seat 30 F is an Economy Class Bulkhead seat that has extra legroom. However, this is a bassinet location and passengers traveling with infants may be seated in this area. The tray table is in the armrest, making the armrest immovable and slightly reducing seat width. There is no floor storage for this seat during takeoff and landing. 30 G None No Power Seat 30 G is an Economy Class Bulkhead seat that has extra legroom. However, this is a bassinet location and passengers traveling with infants may be seated in this area. The tray table is in the armrest, making the armrest immovable and slightly reducing seat width. There is no floor storage for this seat during takeoff and landing. 30 J None No Power Seat 30 J is an Economy Class Exit Row seat that has extra legroom. The tray table is in the armrest, making the armrest immovable and slightly reducing seat width. There is no floor storage for this seat during takeoff and landing. 30 K None No Power Seat 30 K is an Economy Class Exit Row seat that has extra legroom. The tray table is in the armrest, making the armrest immovable and slightly reducing seat width. There is no floor storage for this seat during takeoff and landing. 31 B None No Power Seat 31 B is a standard Economy Class seat. All B seats may have limited legroom and storage space underneath the seat due to the presence of an entertainment equipment box under the seat in front. 31 D None No Power Seat 31 D is a standard Economy Class seat. All D seats may have limited legroom and storage space underneath the seat due to the presence of an entertainment equipment box under the seat in front. 31 G None No Power Seat 31 G is a standard Economy Class seat. All G seats may have limited legroom and storage space underneath the seat due to the presence of an entertainment equipment box under the seat in front. 31 J None No Power Seat 31 J is a standard Economy Class seat. All J seats may have limited legroom and storage space underneath the seat due to the presence of an entertainment equipment box under the seat in front. 32 B None No Power Seat 32 B is a standard Economy Class seat. All B seats may have limited legroom and storage space underneath the seat due to the presence of an entertainment equipment box under the seat in front. 32 D None No Power Seat 32 D is a standard Economy Class seat. All D seats may have limited legroom and storage space underneath the seat due to the presence of an entertainment equipment box under the seat in front. 32 G None No Power Seat 32 G is a standard Economy Class seat. All G seats may have limited legroom and storage space underneath the seat due to the presence of an entertainment equipment box under the seat in front. 32 J None No Power Seat 32 J is a standard Economy Class seat. All J seats may have limited legroom and storage space underneath the seat due to the presence of an entertainment equipment box under the seat in front. 33 B None No Power Seat 33 B is a standard Economy Class seat. All B seats may have limited legroom and storage space underneath the seat due to the presence of an entertainment equipment box under the seat in front. 33 D None No Power Seat 33 D is a standard Economy Class seat. All D seats may have limited legroom and storage space underneath the seat due to the presence of an entertainment equipment box under the seat in front. 33 G None No Power Seat 33 G is a standard Economy Class seat. All G seats may have limited legroom and storage space underneath the seat due to the presence of an entertainment equipment box under the seat in front. 33 J None No Power Seat 33 J is a standard Economy Class seat. All J seats may have limited legroom and storage space underneath the seat due to the presence of an entertainment equipment box under the seat in front. 34 B None No Power Seat 34 B is a standard Economy Class seat. All B seats may have limited legroom and storage space underneath the seat due to the presence of an entertainment equipment box under the seat in front. 34 D None No Power Seat 34 D is a standard Economy Class seat. All D seats may have limited legroom and storage space underneath the seat due to the presence of an entertainment equipment box under the seat in front. 34 G None No Power Seat 34 G is a standard Economy Class seat. All G seats may have limited legroom and storage space underneath the seat due to the presence of an entertainment equipment box under the seat in front. 34 J None No Power Seat 34 J is a standard Economy Class seat. All J seats may have limited legroom and storage space underneath the seat due to the presence of an entertainment equipment box under the seat in front. 35 B None No Power Seat 35 B is a standard Economy Class seat. All B seats may have limited legroom and storage space underneath the seat due to the presence of an entertainment equipment box under the seat in front. 35 D None No Power Seat 35 D is a standard Economy Class seat. All D seats may have limited legroom and storage space underneath the seat due to the presence of an entertainment equipment box under the seat in front. 35 G None No Power Seat 35 G is a standard Economy Class seat. All G seats may have limited legroom and storage space underneath the seat due to the presence of an entertainment equipment box under the seat in front. 35 J None No Power Seat 35 J is a standard Economy Class seat. All J seats may have limited legroom and storage space underneath the seat due to the presence of an entertainment equipment box under the seat in front. 36 B None No Power Seat 36 B is a standard Economy Class seat. All B seats may have limited legroom and storage space underneath the seat due to the presence of an entertainment equipment box under the seat in front. 36 D None No Power Seat 36 D is a standard Economy Class seat. All D seats may have limited legroom and storage space underneath the seat due to the presence of an entertainment equipment box under the seat in front. 36 G None No Power Seat 36 G is a standard Economy Class seat. All G seats may have limited legroom and storage space underneath the seat due to the presence of an entertainment equipment box under the seat in front. 36 J None No Power Seat 36 J is a standard Economy Class seat. All J seats may have limited legroom and storage space underneath the seat due to the presence of an entertainment equipment box under the seat in front. 37 B None No Power Seat 37 B is a standard Economy Class seat. All B seats may have limited legroom and storage space underneath the seat due to the presence of an entertainment equipment box under the seat in front. 37 D None No Power Seat 37 D is a standard Economy Class seat. All D seats may have limited legroom and storage space underneath the seat due to the presence of an entertainment equipment box under the seat in front. 37 G None No Power Seat 37 G is a standard Economy Class seat. All G seats may have limited legroom and storage space underneath the seat due to the presence of an entertainment equipment box under the seat in front. 37 J None No Power Seat 37 J is a standard Economy Class seat. All J seats may have limited legroom and storage space underneath the seat due to the presence of an entertainment equipment box under the seat in front. 38 B None No Power Seat 38 B is a standard Economy Class seat. All B seats may have limited legroom and storage space underneath the seat due to the presence of an entertainment equipment box under the seat in front. 38 D None No Power Seat 38 D is a standard Economy Class seat. All D seats may have limited legroom and storage space underneath the seat due to the presence of an entertainment equipment box under the seat in front. 38 G None No Power Seat 38 G is a standard Economy Class seat. All G seats may have limited legroom and storage space underneath the seat due to the presence of an entertainment equipment box under the seat in front. 38 J None No Power Seat 38 J is a standard Economy Class seat. All J seats may have limited legroom and storage space underneath the seat due to the presence of an entertainment equipment box under the seat in front. 39 B None No Power Seat 39 B is a standard Economy Class seat. All B seats may have limited legroom and storage space underneath the seat due to the presence of an entertainment equipment box under the seat in front. 39 D None No Power Seat 39 D is a standard Economy Class seat. All D seats may have limited legroom and storage space underneath the seat due to the presence of an entertainment equipment box under the seat in front. 39 G None No Power Seat 39 G is a standard Economy Class seat. All G seats may have limited legroom and storage space underneath the seat due to the presence of an entertainment equipment box under the seat in front. 39 J None No Power Seat 39 J is a standard Economy Class seat. All J seats may have limited legroom and storage space underneath the seat due to the presence of an entertainment equipment box under the seat in front. 40 B None No Power Seat 40 B is a standard Economy Class seat. All B seats may have limited legroom and storage space underneath the seat due to the presence of an entertainment equipment box under the seat in front. 40 D None No Power Seat 40 D is a standard Economy Class seat. All D seats may have limited legroom and storage space underneath the seat due to the presence of an entertainment equipment box under the seat in front. 40 G None No Power Seat 40 G is a standard Economy Class seat. All G seats may have limited legroom and storage space underneath the seat due to the presence of an entertainment equipment box under the seat in front. 40 J None No Power Seat 40 J is a standard Economy Class seat. All J seats may have limited legroom and storage space underneath the seat due to the presence of an entertainment equipment box under the seat in front. 41 A None No Power Seat 41 A is a standard Economy Class seat. However, the seats in this area feel cramped and narrower due to the curvature of the plane. Also, the seats in this area are misaligned with those in front of them which causes neck strain when watching the personal TVs located on the back of the seats in front. 41 B None No Power Seat 41 B is a standard Economy Class seat. However, the seats in this area feel cramped and narrower due to the curvature of the plane. Also, the seats in this area are misaligned with those in front of them which causes neck strain when watching the personal TVs located on the back of the seats in front. All B seats may have limited legroom and storage space underneath the seat due to the presence of an entertainment equipment box underneath the seat. 41 D None No Power Seat 41 D is a standard Economy Class seat. However, this seat juts into aisle and may often be bumped by service carts or others passing by due to the awkward configuration transition from 4 to 3 seats. All D seats may have limited legroom and storage space underneath the seat due to the presence of an entertainment equipment box under the seat in front. 41 G None No Power Seat 41 G is a standard Economy Class seat. However, this seat juts into aisle and may often be bumped by service carts or others passing by due to the awkward configuration transition from 4 to 3 seats. All G seats may have limited legroom and storage space underneath the seat due to the presence of an entertainment equipment box under the seat in front. 41 J None No Power Seat 41 J is a standard Economy Class seat. However, the seats in this area feel cramped and narrower due to the curvature of the plane. Also, the seats in this area are misaligned with those in front of them which causes neck strain when watching the personal TVs located on the back of the seats in front. All J seats may have limited legroom and storage space underneath the seat due to the presence of an entertainment equipment box under the seat in front. 41 K None No Power Seat 41 K is a standard Economy Class seat. However, the seats in this area feel cramped and narrower due to the curvature of the plane. Also, the seats in this area are misaligned with those in front of them which causes neck strain when watching the personal TVs located on the back of the seats in front. 42 A None No Power Seat 42 A is a standard Economy Class seat. However, the seats in this area feel cramped and narrower due to the curvature of the plane. Also, the seats in this area are misaligned with those in front of them which causes neck strain when watching the personal TVs located on the back of the seats in front. 42 B None No Power Seat 42 B is a standard Economy Class seat. However, the seats in this area feel cramped and narrower due to the curvature of the plane. Also, the seats in this area are misaligned with those in front of them which causes neck strain when watching the personal TVs located on the back of the seats in front. All B seats may have limited legroom and storage space underneath the seat due to the presence of an entertainment equipment box underneath the seat. 42 D None No Power Seat 42 D is a standard Economy Class seat. However, this seat may have restricted legroom due to the misaligned seats and the awkward configuration transition from 4 to 3 seats. While you have some extra storage space, you'll have to maneuver your legs around the extra seat anchors. The tray table is in the armrest, making the armrests immovable and slightly reducing seat width. All D seats may have limited legroom and storage space underneath the seat due to the presence of an entertainment equipment box under the seat in front. 42 E None No Power Seat 42 E is a standard Economy Class seat. However, this seat may have restricted legroom due to the misaligned seats and the awkward configuration transition from 4 to 3 seats. While you have some extra storage space, you'll have to maneuver your legs around the extra seat anchors. The tray table is in the armrest, making the armrests immovable and slightly reducing seat width. 42 F None No Power Seat 42 F is a standard Economy Class seat. However, this seat may have restricted legroom due to the misaligned seats and the awkward configuration transition from 4 to 3 seats. While you have some extra storage space, you'll have to maneuver your legs around the extra seat anchors. The tray table is in the armrest, making the armrests immovable and slightly reducing seat width. 42 J None No Power Seat 42 J is a standard Economy Class seat. However, the seats in this area feel cramped and narrower due to the curvature of the plane. Also, the seats in this area are misaligned with those in front of them which causes neck strain when watching the personal TVs located on the back of the seats in front. All J seats may have limited legroom and storage space underneath the seat due to the presence of an entertainment equipment box under the seat in front. 42 K None No Power Seat 42 K is a standard Economy Class seat. However, the seats in this area feel cramped and narrower due to the curvature of the plane. Also, the seats in this area are misaligned with those in front of them which causes neck strain when watching the personal TVs located on the back of the seats in front. 43 A None No Power Seat 43 A is a standard Economy Class seat. However, the seats in this area feel cramped and narrower due to the curvature of the plane. Also, the seats in this area are misaligned with those in front of them which causes neck strain when watching the personal TVs located on the back of the seats in front. 43 B None No Power Seat 43 B is a standard Economy Class seat. However, the seats in this area feel cramped and narrower due to the curvature of the plane. Also, the seats in this area are misaligned with those in front of them which causes neck strain when watching the personal TVs located on the back of the seats in front. All B seats may have limited legroom and storage space underneath the seat due to the presence of an entertainment equipment box underneath the seat. 43 D None No Power Seat 43 D is a standard Economy Class seat. However, the proximity to the lavatory may be bothersome. All D seats may have limited legroom and storage space underneath the seat due to the presence of an entertainment equipment box under the seat in front. 43 F None No Power Seat 43 F is a standard Economy Class seat. However, the proximity to the lavatory may be bothersome. 43 J None No Power Seat 43 J is a standard Economy Class seat located in the last row of the plane and may have limited recline. This seat may feel cramped and narrower due to the curvature of the plane. Also, the seats in this area are misaligned with those in front of them which causes neck strain when watching the personal TVs located on the back of the seats in front. All J seats may have limited legroom and storage space underneath the seat due to the presence of an entertainment equipment box under the seat in front. The proximity to the lavatory and galley may be bothersome. 43 K None No Power Seat 43 K is a standard Economy Class seat located in the last row of the plane and may have limited recline. This seat may feel cramped and narrower due to the curvature of the plane. Also, the seats in this area are misaligned with those in front of them which causes neck strain when watching the personal TVs located on the back of the seats in front. All J seats may have limited legroom and storage space underneath the seat due to the presence of an entertainment equipment box under the seat in front. The proximity to the lavatory and galley may be bothersome. 44 A None No Power Seat 44 A is an Economy Class seat located in the last row of the plane and may have limited recline. The proximity to the lavatory and galley may be bothersome. 44 B None No Power Seat 44 B is an Economy Class seat located in the last row of the plane and may have limited recline. The proximity to the lavatory and galley may be bothersome. All B seats may have limited legroom and storage space underneath the seat due to the presence of an entertainment equipment box under the seat in front. 44 D None No Power Seat 44 D is an Economy Class seat located in the last row of the plane and may have limited recline. The proximity to the lavatory and galley may be bothersome. All D seats may have limited legroom and storage space underneath the seat due to the presence of an entertainment equipment box under the seat in front. 44 E None No Power Seat 44 E is an Economy Class seat located in the last row of the plane and may have limited recline. The proximity to the lavatory and galley may be bothersome. 44 F None No Power Seat 44 F is an Economy Class seat located in the last row of the plane and may have limited recline. The proximity to the lavatory and galley may be bothersome. First Class and Business Class feature AC power ports. There is no power in Economy. There are three different versions of the A330-300 operating in the Qatar Airways fleet. There are two versions of this aircraft featuring three classes of service. 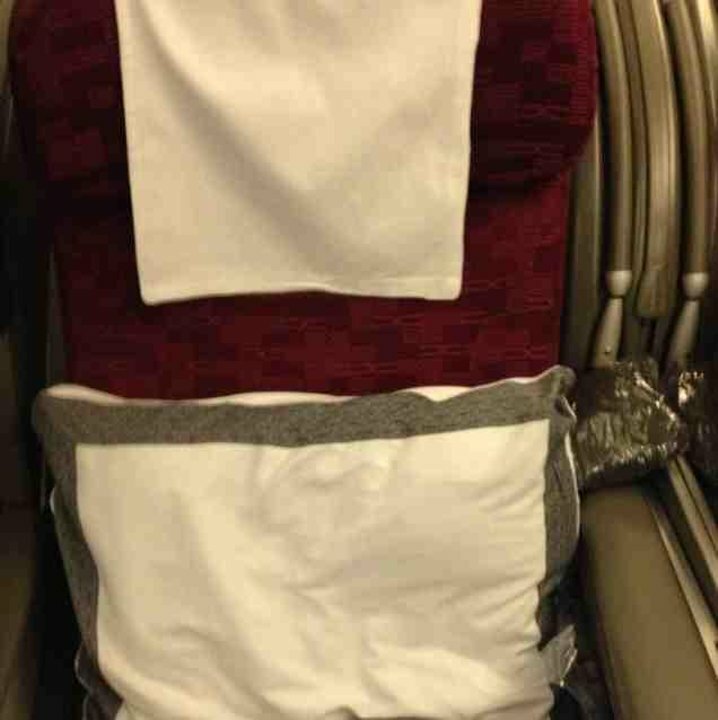 This Version operates with the First Class between rows 1 and 3, the Business Class between rows 10 and 14, and the Economy Class starting at row 16 and ending at row 44. This aircraft is used for a variety of long-haul destinations and it flies with 12 seats of First Class, 24 seats of Business Class, and 225 seats of Economy Class. In the Economy Class, all B, D, G and J seats on the A330-300s may have limited legroom and storage space underneath the seat due to the presence of an entertainment equipment box under the seat in front. I flew Barcelona to Doha end of March and was in economy seat 19K which is a window seat. The seats are comfortable, you have plenty of leg room, video monitor in seat back in front of you with a remote control located in the armrest. There is a usb chargin port near the monitor. Economy on Qatar isn't bad. The only negative about this seat was there is a equipment box under the seat in front of you limiting your leg room. While I am only 5'3", I found it uncomfortable and I didn't check comments for this seat! The aisle seat near me 19G also has a box under seat in front of it. I would avoid this row if possible. Meals were only o.k. Plenty of overhead storage, awesome movie choices! My remote didn't work well though, that was a pain! There is a huge entertainment box at the bottom that will crank your feet. I could hardly put only one leg, better to choose an aisle seat. Flew TXL-DOH. The best Version of the A330. The seat was a lie flat, very comfortable and, lot of space. Very dissapointed with my Business class seat, 12A, which was more cramped than I have previously encountered with Qatar, an did not go flat, leaving one sliding down the seat for seven hours. Will not fly Qatar on this type of plane again! Qatar Airways flies 2 versions of Airbus A330-300 (333) V1.